Environmental stewardship has received much attention in the wine industry, but firms must also address social sustainability to be considered sustainable enterprises. This means growing wine grapes and making wine in ways that are environmentally sound, socially equitable, and economically viable. On the production side it is (or should be) about commitment to communities and commitment to workers ? taking care to provide workers a healthy environment in which to work in the vineyard and in the winery. Employee-related issues include workplace opportunity, human resource policies, quality of life, governance, democratic processes, worker development, gender diversity, bonus-pay systems, seasonal worker housing and health insurance. Additional societal concerns include local purchases, local hiring, supporting local community events, product impacts on society, treatment of the under-privileged, and being a good citizen in the community. Following are best practices by wineries, prominent charities and good works in various regions. Californias Talley Vineyards established an endowment in 2004, the Fund for Vineyard and Farm Workers, with the goal of amassing a $1M fund, the interest of which will fund (in perpetuity) grants to nonprofit organizations that assist San Luis Obispo County agricultural workers and their families. Their Mano Tinta series is specially designated for the fund, and local grape growers and winemakers are invited to produce their own specially designated wine as cause marketing for the endowments sake. Mano Tinta, Red Hand, is a wine dedicated to the pride and commitment of farm workers to their craft. All of the grapes, materials and services used to make this wine are donated and all profits from the sales of Mano Tinta benefit the Fund. Domaine Chandon in Argentina has collaborated with its neighbors on a program for children of harvest workers called “Education in Harvest.” The harvest workers had been accustomed to taking their children to the vineyard at harvest time, which exposed them to a variety of risks and accidents. Since 2006, Bodegas Chandon has been going beyond the legal framework related to child labor and has implemented a recreational education program for children of pickers at harvest time. This happens during the month of February, when the children are not attending school. Up to 100 children between the ages of 1 and 15 are moved from their rural homes to the nursery garden and sports center of Tupungato, where they participate in sports and recreational activities. They also receive breakfast, lunch and medical checks. At the regional level, organizations are engaging with social responsibility in a number of exciting ways. Bonded by their geography, participating vineyards and wineries are joining together for greater social involvement, too. 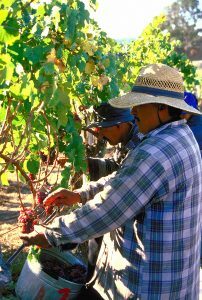 The mission of the Napa Valley Farmworker Foundation is to support and promote Napa Valley’s vineyard workers through education and professional development (ranging from safety in the vineyard to English language) totaling over 215 hours to more than 2,800 farmworkers in 2014. The foundation offers other valuable community resources. Napa growers assess themselves in order to fund farmworker-housing centers, where individuals benefit from lodging, meals, laundry, and recreational amenities. Sonoma County grape growers have stepped up their commitment to improve the social plight of their workforce by contributing nearly $100,000 towards construction of a farmworker-housing complex. The Foundation raised the money from donations from companies such as Balleto Vineyards and Winery, Rodney Strong Wine Estates, the Rubin Family of Wines, Sangiacomo Vineyards, Vino Farms and Jackson Family Wines.